We have established ourselves as a reputed firm engaged in offering a gamut of Stand Up Pouches. 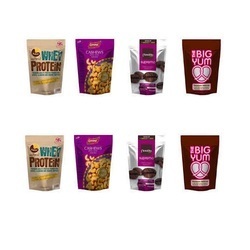 Our range comprises Stand Up Pouches, Stand Up Zipper Pouches, Stand Up Pouch and Plain Stand Up Pouch. The entire range of products are ideal to be displayed on shelves in order to enhance the sale. Manufactured using finest quality material, which enables them to sustain the quality of packed products for a longer time. Available in swanky designs and magnificent colors, these products can also be customized as per the clients requirements. We are reckoned as notable Printed Stand Up Pouches Manufacture & Supplier in India. 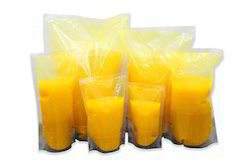 Now a days these Stand Up Pouches are widely used in retail packaging Supplies. Stand up pouches excellent shelf display properties which catches the attention of the Buyer towards the Product.Printed Stand Up Pouches are printed by means of rotogravure reverse design cylinders. In design of our Printed Stand Up Pouches, (Ink) gets sandwich between two layers of films so the design remains scratch proof. The laminates for Printed Stand Up Pouches are selected as per the requirement of your product. The minimum Printed Stand Up Pouches produced is 20000 Pcs. in one go. We can print up to 8 color design with excellent registration. We are the manufacturers and supplier of the Stand Up Pouch Material. Our Plain Stand Up Pouches are available in ready stock and are suitable for packing 50g to 1 kg products. Plain Stand Up Pouches that we provide are suitable for packing various kind of products like pickles, sweets like gulab jamun, rasgullas, mouth freshners, dry fruits, ice cream mix, colour powder, etc. Plain Stand Up Pouches, offered by us, are specially fabricated with different seal designed to make them stand properly and free from leakage. Our Plain Stand Up Pouches can be easily Screen printed else, offset printed multi colour labels can also be applied over them. Our Stand Up pouches are available in Retail as well in Wholesale Food Packaging Supplies. In Pouch Packaging We can deliver bulk orders of Plain Stand Up Pouches within two working days.